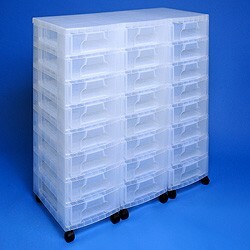 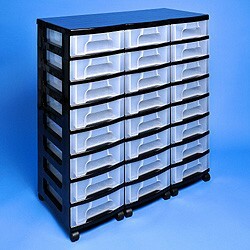 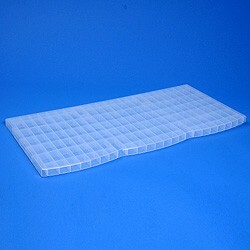 You may choose the colour of the included drawers when ordering, but all drawers must be of the same colour. 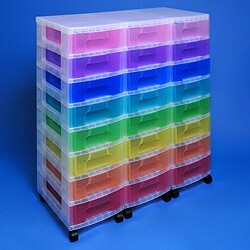 The exceptions to this are the "Rainbow" colour choices where the Storage tower includes 3 each of 8 different transparent coloured drawers ("transparent rainbow drawers"), cool coloured drawers ("cool rainbow drawers") or bright/solid coloured drawers ("bright rainbow drawers"). 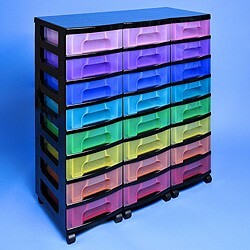 You can also choose "triple rainbow drawers" to receive a different rainbow set (transparent, cool and bright) in each section of the storage tower.